Before beginning any project, you’ll want to read through the owner’s manual that came with your lawnmower. This will ensure you have all necessary tools and parts on hand. This is also where you’ll find the manufacturer’s specifications for parts and fluids referenced later in this article. Just like your car, your lawn mower runs best with clean oil. Drain all of the old oil and replace it with new oil per manufacturer’s specifications. Ideally, you should change your oil at least once per year. Your air filter keeps dust, dirt and other debris from entering your mower’s carburetor and engine. Paper filters must be replaced. However, foam air filters can be cleaned, dried and reused. An old fuel filter can cause poor fuel economy as well as potential engine damage. Remove the filter and drain the fuel already in the line into a drain pan. Place the old filter into the same pan and install the new filter. Be sure to note the direction of the fuel flow arrows on the new filter. Old spark plugs should be changed if you notice any corrosion. If these aren’t changed, your motor will not function properly. Even if you decide your spark plugs do not need to be replaced, you’ll want to remove and clean them to ensure they’re working optimally. If your belts are showing any signs of cracking or dry rot, they’ll need to be replaced. Even if your belts don’t need to be changed, you’ll want to make sure they’re feeding through the pulleys properly. Sharp blades will not only perform better, they’ll keep your lawn healthier. Remove the blades and sharpen them using a metal file. Many home improvement stores can also do this for you. Rocks and roots can damage blades beyond repair, so if your blades are chipped or cracked, they’ll need to be replaced. To make sure the moving parts on your lawn mower stay moving, you’ll want to use proper lubrication. If your mower has grease fittings on the mower deck and other attachments, be sure to grease them using the type of grease recommended by the manufacturer. If your mower does not have grease fittings, use an all-purpose lubricant. If necessary, make sure your tires have the manufacturer’s recommended amount of air pressure. Use a tire pressure gauge to ensure even pressure on each corner. Uneven inflation can cause uneven cutting of your lawn. Even if you’ve performed all of the previous steps, your mower still may not be running as efficiently as possible. To make sure your mower starts quickly and idles smoothly, add Start Your Engines! ® Fuel System Revitalizer to your fuel system as directed. This will revitalize your entire fuel system and can be used on all 2-cycle and 4-cycle engines. Your mower is now ready for a long season of grass cutting. 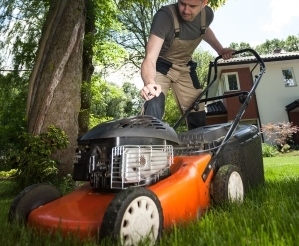 Be sure to regularly inspect your mower throughout the year to avoid unforeseen problems. Continue to perform proper maintenance on your mower, and it will keep running for years to come.